PRI’s Policy Director, Andrea Huber, describes, how a pilot research project in Kenya is paving the way for community service and probation orders more sensitive to the needs of women offenders. ‘So, Kenya is a bit of a guinea pig?’ says our partner from Kenyan Probation Service jokingly, when I described our pilot project on women offenders in Kenya to the participants of a validation meeting on 6 May in Nairobi. ‘Rather than guinea pigs, I prefer to see Kenya as pioneers in this project’, I respond, and this is indeed the case. It is hard to believe, but other than a study in 2013 by the Griffin Society (‘Missing Voices’) about reasons for women breaching such orders in the UK, we have not come across any such research, despite our intensive monitoring in this area. Are gender-specific considerations explored and taken into account in pre-sentence reports and community sanctions? Do conditions have to be different for women than for male offenders? Do women face particular challenges when serving non-custodial sentences? What types of work should they be assigned to that are suitable and safe, but not gendered? ‎Having identified this gap, we developed the concept for a pilot project that would research and test community service and probation models adjusted to women’s backgrounds and needs. 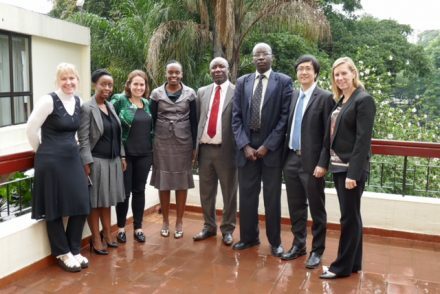 The pilot has been developed together with the Kenya Probation and Aftercare Service, with which PRI has a long-standing and ‎fruitful partnership. The project would not be possible without the generous funding of the Thailand Institute of Justice (TIJ) or the commitment of the Kenya Probation and Aftercare Service to improve its services, overall and for women offenders specifically. With these preconditions magically falling into place, we were able to commission pilot research into the practice of community service and probation orders ‎for women offenders in Kenya, conducted between February 2016 and April 2016, and we have just returned from a visit to Nairobi last week to discuss the findings and next steps in the project. At the centre of our visit was a meeting to discuss the draft of a research report on women serving community service and probation orders in Kenya, conducted by lead researcher, Sarah ‎Kinyanjui. The validation meeting was opened by Deputy Director, Mary Mbau. Experts from the Kenya Probation Service, Penal Reform International, Sarah,‎ and one of her research assistants, Elizabeth Odhiambo, as well as magistrate and national community service coordinator, Atiang Mitula, attended the consultation. To feed in expertise from other jurisdictions, ‎we were lucky to be joined by Wisoot Chanthadansuwan from the Thailand Institute of Justice, and Emily Salisbury, Associate Professor at the University of Nevada, Las Vegas, who had developed a comprehensive gender-sensitive assessment tool in the US. We were honoured to also be joined, during the morning ‎session, by Hon. Justice Jessie Lesiit, presiding Judge of the High Court Criminal Division, and Rose Otieno, High Court Deputy Registrar. The research is the first of its kind, interviewing magistrates and probation officers to find out about current practices and experiences, and interviewing women who have served such orders to collect their own views and experiences. What challenges did they face when conducting community service? Were probation orders gender-sensitive? ‎And what does this even mean in practice? Lead researcher, Sarah Kinyanjui, and her research assistants, Elizabeth Odiambo, Mercy Mwarah Deche and Halima Ali conducted interviews with 97 female offenders in Kibera (Nairobi), Mombasa, Nyeri, Maua (Meru), Garissa, Bungoma, Kisii, Kisumu, Makindu and Kapsabet. The regions were selected to provide, as far as possible within our budget constraints, a representational sample, which included urban, peri-urban and rural contexts, and a range of court stations of different sizes that provide a sizeable non-custodial sentences regime. Interviews were also conducted at Nakuru Probation Hostel. Furthermore, 20 judicial officers, 22 probation officers and 18 community service supervisors were interviewed. A focus group discussion held with women serving community service orders in Maua, to capture experiences in a pilot project run by the Kenyan Probation Service there. All interviewees were assured of the anonymity of their responses. The research revealed interesting findings, such as for example, the particular impact that the Forest Act has on women, by penalising the cutting down or taking of any forest produce. As this is how women in financially difficult situations collect their firewood to cook for their family, this law has a particular impact on women. Another offence women are commonly arrested for is selling alcohol without a licence. For a number of reasons, producing and selling alcohol often seems the only viable source of income, especially for women who are sole or primary caretakers of small children and have few financial resources. Women can brew it in their homes and are able to look after their children at the same time; and they get the ingredients in advance and pay once the product is sold, therefore solving the problem of not having the capital for a business. The research showed that women serving community and probation orders struggle to pay for the transport they need to attend their appointments at the probation office. When female offenders are assigned to work stations far from their homes, this not surprisingly affects their caretaking obligations, but it also reduces their chances of securing casual jobs after the community service, especially if such work was assigned for too many consecutive days over a longer period of time. Because of the commuting time, many women lost the critical morning hours when casual jobs are usually available. By comparison, when the women were allocated to stations that were easily accessible and where the working hours were structured in a way that would allow ‘off days’, they were able to meet their financial obligations as well as successfully serve their sentences. The research report, which contains many more interesting findings, will now be finalised based on the feedback of project partners and experts, incorporating the discussions last week. Overall, the women were so grateful to avoid prison by a community service order that the interviewees felt complaints would not be appropriate. Also, despite assurances of anonymity, the researchers had the impression that the women were fearful of prejudicing their sentence if they spoke ill of the conditions of their non-custodial sentence. Even more reason why we want to use this occasion to send our heartfelt gratitude to the women who agreed to being interviewed for our study. They did not have any incentive to do so, and we appreciate their trust and bravery in sharing their experiences with us. We will seek to ensure that their input will help to improve the system for women who will be serving community and probation orders in Kenya in the future.